B-2 was built by Northrop/Northrop Grumman, the prime contractor. Boeing was or is one of the principle subcontractors as is/was Hughes (Raytheon) Aircraft for radar and GE for engines. The then-Vought company built the inboard wing sections with Boeing building the wings and the weapons bay. Air Vehicle #1 (AV-1) was the first B-2 built of six aircraft for the flight test program. The original contract specified 132 aircraft, but before the first one flew the number was cut to 75 aircraft, then again to 20 aircraft, with all but AV-1 to be delivered to the operational Wing at Whiteman AFB. So, AV-7 through -21 were delivered to Whiteman, and AV-2 to -6 were returned to the factory for removal of flight test hardware and an upgrade to the final Block 30 configuration. Then about 1997, the Clinton administration proposed upgrading AV-1 to Block 30 and delivering it to the Wing. Congress authorized the funds in the form of a fixed-price contract, and AV-1 was completely rebuilt and delivered to Wing as the Spirit of America. I've heard that this was the first program where all aircraft built, including all the flight test ships, were put into operational service. That's why there are now 21 B-2s in the fleet. 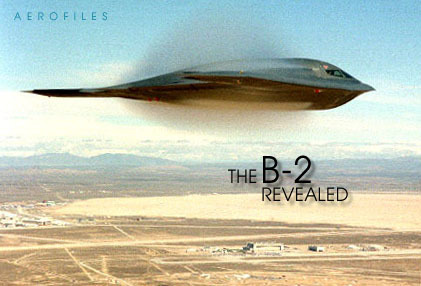 In a way, AV-1 was the first and the last B-2 to be built. Northrop uses the AV numberone of their internal sequential number systemsand, at the factory level, the four-digit code, ostensibly the contractor number (c/n). It can be very confusing having only 21 aircraft with several ways of being referred to. USAF uses the tail-number system (s/n), and the Spiritnames, as well. To make it as confusing as possible they all have an Air Combat Command (ACC) number assigned in the order they were delivered to the 509th Bomb Wing. They didn't get delivered in the order they were built when manufacturing problems caused some of them to fall out of order.